Well - here we've arrived at Katrina and Stéphanes at Werentzhouse - a small town close to the French, Swiss and German borders where the major business centre is Basel. This is the prettiest town - but hope you don't forget the milk 'cos the nearest shop is in the next village. vair-entz-oose. But now you have to say it twice as fast as you just did !! Here you can see the local church, conveniently close to their apartment on the ground floor of the camel-coloured building. Convenient, that is, if you don't need to sleep -- the small bells ring every quarter hour and the big bells chime the hour every hour. Four small chimes (to announce the full hour) and twelve huge chimes for midnight creates a demand for ear plugs. By the way, Katrina doesn't wear a watch any more! Here we are in front of a neighbour's house - with their own creek (it did used to have a water wheel, apparently). They do like their garden ornaments. Competition time: The first one of our many readers to submit the correct number of garden ornaments will receive one of these highly desirable enhancements for their own garden. Be quick, because there will surely be fierce competition. All of a sudden ..... what was this??? Stéphane explained that this concrete "block-haus" (or fortified bunker) was a part of the Maginot Line -- a line of fortifications, machine gun posts and other defences against the German invasion. It could have been called the "Imaginary Line" for all the good it did. 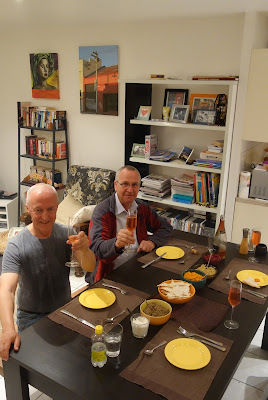 Here we are after a hard day's touring - enjoying one of the many sumptuous feasts provided by Katrina and Stéphane. Between Werentzhouse and Basel is the amazing Mariastein Abbey. It's the second most famous stop for pilgrims. Way under the church, and built into the cliff face, is the Grotto. The Abbey is dedicated to Mary and her miracles. In the corridors leading to the tunnel to the Grotto, you can see the plaques of families who have given donations to the Abbey. The next day, another sumptuous feast in a park in Basel, just over the border (in Switzerland). Daryl saw his very first live squirrel. Can you see it in the background? After lunch in the park, we walked through the Old Town area. This impressive building is called a Rathaus. Now that is NOT what it sounds like - it's a Town Hall. We prefer the French expression for Town Hall - Hôtel de Ville. You see, this is a very educational blog. Not the tram you would typically see in Melbourne (or in Basel, for that matter). An interesting way of getting across the Rhine. It's not a powered boat. If you look carefully, you may be able to see the cable to which the boat is attached. The flow of the river provides the 'power' to get the boat across to the other side. It's amazing how fast this river flows. It's a very strong current. Crazy people like Katrina and Stéphane jump in and hope that they will get safely to the intended point further along the river. At 6 pm every Tuesday during summer, many of the other crazy locals do the same thing. They call it the Rhine Swim -- we call it something else. In many of the villages and along the roads in Normandy and Alsace, where the war was most intense, you will commonly see a crucifix. All through Alsace, we saw fields of corn or grape vines or sunflowers. 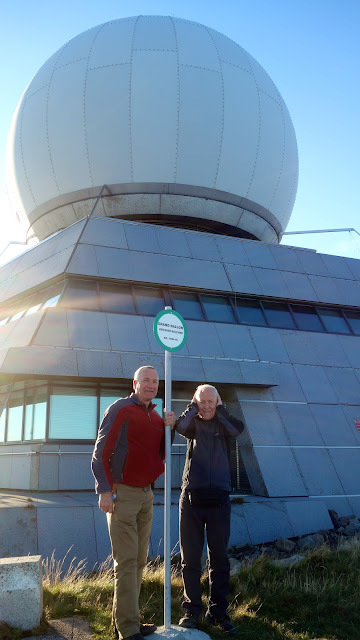 The final destination for the day is the "Grand Ballon," the highest peak of The Vosges mountain range. On the top of this peak is one of the radar stations for aviation. Here's a close-up view ... (boy, was the wind whistling!) I lost hair and Daryl's forehead stretched!